The Borough Office will be Closed tomorrow Thursday, April 18th due to Training and Friday, April 19th for Good Friday. Hope you all have a Wonderful weekend! Happy Easter! The annual community egg hunt, sponsored by Coplay Recreation & Welfare Association will be held Saturday, APRIL 20 at 1 PM. Held on the grounds of St. Peters Church, 5th & Center Streets, The egg hunt is for all borough children up to age 8. The Easter Bunny will be on site for Pictures. We are still accepting applications for the following Seasonal positions: Lifeguards- top by the borough office to pick up an application. THURSDAY, MAY 9TH – Front, 3rd, 5th, Cherry, 7th, 9th, 11th, 13th, Chestnut, Keefer, Maple, Oak, Center & Center Circle, Hokendauqua, Bridge and Poplar Streets. FRIDAY, MAY 10TH – 2nd, 4th, 6th, Wall, 8th, 10th, 12th, Lehigh, Coplay Streets, Schreiber Ave, Saylor & Saylor Circle, Magna & Magna Circle East and West, Tapler, Margaret, Barbara, Catherine, and Bernice Drives, and Ruch Street. Whitehall-Coplay Food Pantries The Whitehall and Coplay Food Pantries provide much needed food for our residents. As you heard me say many times before, NO ONE in this country as rich as we are, should ever be hungry. This really bothers me and so many others. Food insecurity in America was almost wiped out due to provisions President Johnson’s administration put into law back in the 1960’s. Sadly, fifty years later, we still have food insecurity. I’ll get off my soapbox and save this story for another day. Whitehall residents can obtain food from the Whitehall Pantry by showing proof of residency, a photo id, and meet state income eligibility. The Pantry is open every Monday from 6-8 pm and is located at St Stephen’s Episcopal Church, 3900 Mechanicsville Rd (near the high school) on the left rear side of the church building. Residents may receive food once a month and should make an appointment with Doreen Wagner, Director of the Pantry, at 484-246-5715. The Whitehall Pantry is run by a coalition of churches: St Stephen’s Episcopal, Faith Lutheran, St John’s UCC on Grape St, St John’s UCC Mickley’s, St John’s Lutheran on 3rd St, and First Presbyterian of Hokey. Many volunteers are needed behind the scenes to make this mission a success. The Pantry gets food from Second Harvest, Walmart, Weis, Bonefish Grill, Chick-fil-A, and Entenmann’s. The local Boy Scouts and the USPS each organize a food drive once a year providing additional needed food. (Please do not donate open boxes, outdated items, or damaged/dented cans. The donations are sorted and these items are discarded). Many local churches, civic organizations, and residents provide food and monetary donations on a regular basis throughout the year, which is essential to the Pantry. Food items needed include: coffee, pasta/noodles, canned vegetables, pasta meals (i.e. hamburger helper, etc), boxed mashed potatoes, canned fruit, canned soup, cereal, pasta sauce, and large bottles of juice for monthly distribution. Items may be dropped off at the Pantry on Monday between 5 and 6 pm. David Cool, Agency Relations Coordinator at Second Harvest Food Bank of Lehigh Valley & Northeast PA, provided the Whitehall Pantry data from July 2018 through January 2019. On average, the Whitehall Pantry has served 193 adults, 106 seniors, and 73 children a month. These numbers would be much higher if more residents had transportation to get to the Pantry or it was open at a time when the residents are not working. Yes, many food insecure people are the working poor. David says “Second Harvest Food Bank needs volunteers every month to help with packing, sorting, or Free Friday. For more info, please call 484-287-4015 and ask for Ida.” Second Harvest also provides Senior Boxes aka Sunshine Boxes, which are also available to Whitehall & Coplay residents. Whitehall Pantry serves about 20 senior boxes each month. To qualify, a resident needs to be age 60 or older and fall under the 130% poverty level (income: yearly – $15,782, monthly – $1,316, weekly – $304). These boxes are in addition to the monthly Pantry food. The boxes usually include 4 cans of vegetables, 2 large bottles of juice, 2 cans of fruit, 1 meat (canned chicken, beef stew, or chili), 2.5 lb block of cheese, 2 shelf stable milk, 1 peanut butter, 2 boxes of cereal, and 1 pasta or rice. Dry milk is provided 6 times a year. Coplay residents are also encouraged to take advantage of this program by going through the Whitehall Pantry. For more info, please contact Renee Gombert at 484-358-6722. Jodi manages the Coplay Food Pantry at the Municipal Building at 98 S 4th St. The Pantry is open to Coplay residents the second Tuesday of each month from 8:30-10:00 am. Proof of residency is required when applying for food. Staples such as spaghetti sauce, small peanut butter/jelly, crackers, coffee, and any type of paper products are appreciated. Please call Jodi at 610-262-0928 with questions. Food and monetary donations would be greatly appreciated at both the Pantries listed above. A big thank you goes out to Doreen, Jodi and all the volunteers and the public who donate to so much time, talent, and treasures to help feed our neighbors. The recipients are also very thankful to all of you. Coplay Borough 150th Year Anniversary gear. Photos Posted on the Borough Facebook page. Introducing: "MedRx Return-Drug Collection Unit", located in the Coplay Municipal Building Lobby right next to the Police Station door. Hours of operation are Monday - Friday from 8 AM - 4:00 PM. Materials Accepted include: Prescriptions, over-the-counter medications and samples, vitamins, prescription ointments, prescription patches, and pet medication. Materials NOT Accepted include: syringes, needles, sharps or other sharps objects, medications from businesses and clinics, lotions or liquids, aerosol cans, inhalers, hydrogen peroxide, and thermometers. Available at the Borough Office are long sleeve shirts and sweatshirts, with or without hood. We have numerous sizes in the office. Front display of shirt says "Little Town That Could Coplay, PA" and the back displays "1 Sq. Mile of Gods Little Masterpiece". Office hours are Monday thru Friday 8 AM to 4:00 PM Discount prices, limited sizes available. The Borough of Coplay is situated along the Lehigh River, about 5 miles north of Allentown. It is part of the 400 acres of land John Jacob Schreiber bought from the William Penn heirs in 1740. For a long time it was known as Schreibers. Later it was known as the Lehigh Valley, because of the Lehigh Valley Iron Furnaces that were located here. Lehigh Valley was then changed to Coplay. This name came from "Kolapechka". The son of the Indian chief, Paxanosa, who lived at the head of the creek near Schnecksville. 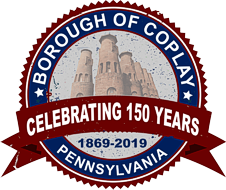 The Borough of Coplay was formed out of a part of Whitehall Township in 1869 and was incorporated as a borough on April 7th, 1869. Gradually Coplay changed from a farming area into an Industrial Community. The Thomas Iron Company started the change. They brought in workers and built homes for them. When the Iron Company was liquidated, other industries gradually came to Coplay; the Cement Mill, the Silk Mill, the Cigar Factory and Knitting Mill. Coplay became a "melting pot" of many nationalities. The Pennsylvania Dutch and Germans, who were the agricultural element. Due to growth of the Iron Industry, immigrants from Ireland came. Then, in the early nineteen hundreds, the Cement Mills attracted immigrants from Austria, Hungary, Czechoslovakia, Poland and the Ukrainian Countries. It was thus that our town had its early beginnings.